Hey everyone, it’s Whatever Wednesdays again. 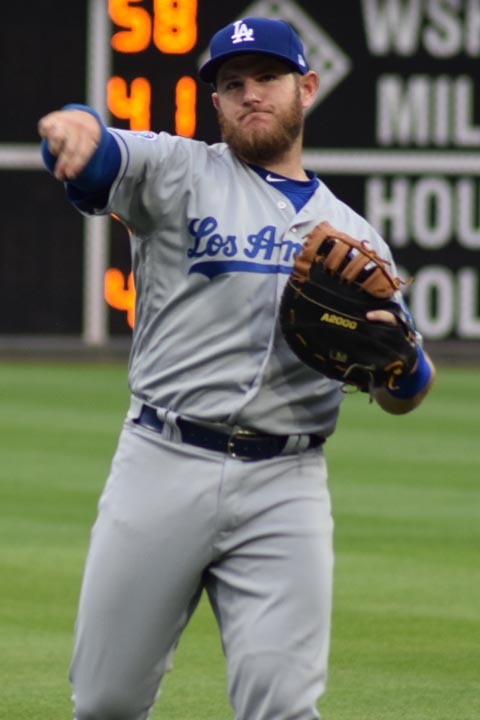 Today is going to be somewhat of a random post about my boy “Max Muncy“. If you don’t watch baseball, you won’t know his name. Actually, even if you DO watch baseball you probably don’t know his name. When you think about the Dodgers the big names that come to mind are Clayton Kershaw, Corey Seager, Cody Bellinger, Yasiel Puig, and more recently Manny Machado. However, today I’m going to go over why Max Muncy is my favorite player. First things first. I’m kind of a fan of the underdog, the guys who are good, but not overwhelmingly great. The same goes for teams, which is why one of my favorite teams was the 1988 LA Dodgers. By all accounts they were outclassed in pretty much all categories and yet somehow managed to win the World Series. Max Muncy has a great story. Max Muncy was a 5th round draft pick for the Oakland Athletics back during the 2012 Baseball Draft. He played single A ball for 2012, A-advanced and double A for 2013. He moved up to AAA ball in 2015. Through those seasons he had a decent average and decent run production, but hitting home runs wasn’t his specialty. He finally got his shot in the majors April 2015, hitting his first big league home run on May 17, 2015. The problem for Max was that he was bounced between AAA and the Majors for 2015 and 2016. He batted only 0.206 in 2015 and 0.186 in 2016. To be honest, you couldn’t really blame the Oakland A’s for releasing him toward the end of spring training in 2017. … but not for Max. Sometimes life is about being lucky and flexible. The Dodger general manager Farhan Zaidi knew Muncy during their time together in Oakland. After Max was released, Zaidi reached out and asked a question: Do you want a job? At this point in time, Max was hanging out back home trying to figure out whether he should try to give baseball one more try, or go find a different job. Max takes the second chance with the Dodgers. He signed a contract and went to the Triple A Oklahoma City. Muncy talks about the Oklahoma City Sheraton being his home for that year. His parents live in Keller, Tx — where Max grew up and went to high school, which is 3 hours from Oklahoma City. So what do parents who want to support their son do? They spend the better part of a year making that drive back and forth to go to his games. Max Muncy got his shot with the Dodgers and in his first at bat, got a pinch hit single, then hitting a home run in his second at bat the same game. Since then he basically has just been tearing the cover off the ball. However he did have his own share of troubles. Why is he so good now? Max Muncy has an elite eye. I think he is able to tell ball from strike very early out of the pitcher’s hand. That is one thing that has never changed. Additionally, it’s a rare combination of inborn talent and discipline which allows him to get a high percentage of walks. Pitchers know that he won’t chase so it forces them to throw more strikes to him. So it really puts pressure on them to nail corners and not leave things over the plate. Then they get behind in the count. After that, maybe they don’t miss enough and leave it over the plate. The problem with that is that if you throw Max Muncy a strike he’ll hit it over a wall. Max Muncy is a very difficult out to get. His approach to the plate is very similar to Justin Turner actually and I would imagine Justin’s plate discipline has rubbed off on him. This is best highlighted by this at-bat which lasted 11 pitches where he hit the last pitch over the fence. Always, Muncy has known his way around the strike zone. Dodgers starter Ross Stripling faced him in high school (Stripling pitched for Carroll High in Southlake, Texas) and in college (Muncy played at Baylor, Stripling at Texas A&M). Though they didn’t get to know each other until both became Dodgers, Stripling certainly knew enough of Muncy to try to avoid him when they were in school. By the way, I really like Ross Stripling too. Unfortunately, he had some difficulties down the stretch of this season. I hope they give him a chance to play in the NLCS. Maybe I’ll do another article on Ross later. Overall, I think Ross Stripling has good stuff overall. What sets Ross apart from other pitchers is his preparation. You can tell he has a plan for every single batter that he could possibly see. He is the most dominant when he is outthinking hitters and hitting his spots. Unfortunately, since his stuff isn’t overpowering, his margin for error is more thin than some other pitchers that have ++ stuff. Another thing that I think people kind of get wrong is that Max is always trying to hit home runs. I really don’t think he’s trying to do that. I think he’s just trying to make good contact with the barrel of the bat to the ball. Sometimes that contact results in singles or doubles, sometimes it results in home runs. Sometimes you get unlucky and you hit it right at someone. However, if you look at his home runs, none of them fly particularly far. I doubt we’ll see many 440+ ft home runs from Max. Most of his home runs are probably around 390-400 ft.
Also, he gets a lot of walks. His home runs gets a lot of talk, but his on base percentage is also very good at 0.391 for the season. That’s good enough for #12 with 475 minimum plate appearances. Unfortunately, he missed a few weeks in the season and wouldn’t be in the list for 500 minimum plate appearances, otherwise he’d probably be in the top ten. What do you expect from Muncy? When Max started, I liked him immediately. His approach at the plate was great and the way he seemed to be able to see a strike or a ball right out of the pitcher’s hand really excited me. However, my co-worker, who is also a Dodgers fan was not quite as optimistic. He felt Max was playing way beyond his abilities and was going to cool down. During that slow stint for Max in July and August he gave me the “I told you so” look. However, I never lost faith. I believe (and still believe) that Max Muncy will be a career 0.250+ hitter, hit 25-30+ home runs a year, and maintain an on-base-percentage that is in the top 50 yearly. Perhaps I’m just an optimist, but I think he has the tools, work ethic, and grit to be a cornerstone for the Dodgers. I hope the Dodgers never trade him. Does Muncy have a rookie card? His only “rookie card” is shared with Tyler Ladendorf from the 2015 Topps Update. However, if you want what I consider to be his best card, you’ll want to try to find a Panini America’s 2012 Elite Extra Edition Autographed. Ideally you’d want it with the red ink. Why red ink? Well, the red ink is a variation of the autographed cards of which only 25 exist, so it’s pretty special. Of course, don’t expect to make any money off baseball cards. Nowadays they really only hold sentimental value. However, who knows. Maybe in 30 years when the whole world is digital, people will want to have something that is tangible again and we will see a resurgence. Only time will tell. I love the underdogs and I like Max Muncy. He has a great story. Dodgers, please don’t trade him.